The mission of the Annals of International Occupational Therapy is to advance and promote research and practice of occupational therapy worldwide. The Annals of International Occupational Therapy is a quarterly peer-reviewed journal that includes original articles that focus on research as related to the clinical practice of occupational therapy worldwide. Manuscripts that are appropriate for the journal include original research, randomized controlled trials, meta-analyses and systematic reviews, position papers, and prospective and retrospective case studies and case reports. Also appropriate are conceptual reviews, correlational studies, research on educational issues, and surveys of factors or variables impacting occupational therapy practice. The Journal offers an author-friendly approach from submission through publication. The Annals of International Occupational Therapy adheres to the Recommendations for the Conduct, Reporting, Editing, and Publication of Scholarly Work in Medical Journals (2013) of the International Committee of Medical Journal Editors. One author must be identified as the corresponding author, who is responsible for (1) ensuring all authors meet the authorship criteria and complete the required Author Statement-ICMJE Form for Disclosure of Potential Conflicts of Interest; (2) submitting the manuscript to the Journal and serving as the main contact during the review process; and (3) performing any related activities if the manuscript is accepted, such as reviewing proofs of the edited manuscript and answering editorial queries. The corresponding author will be identified as the primary contact in the published article. Order of authorship must be determined and agreed upon by all authors before manuscript submission. Any disagreements should be resolved before submitting the manuscript. Changes in authorship (ie, order, addition, and/or deletion of authors) must be approved by all authors. Requests for changes in authorship after initial manuscript submission and before publication are required in writing (email preferred) signed by all authors. Any individuals who contributed to the manuscript but do not meet the necessary criteria for authorship should be acknowledged. Acknowledgments should be limited to those who helped extensively, such as providing statistical help, essential equipment, or laboratory services; or translating references. Manuscripts are accepted with the understanding that they have not been previously published (in print or online) and are not under simultaneous consideration by another publication. Accepted manuscripts become the permanent property of the Journal and will not be published until the Author Statement-ICMJE Form for Disclosure of Potential Conflicts of Interest has been completed in full by each author. Reports of studies involving human subjects must indicate procedures for the protection of their rights, informed consent, as well as Institutional Review Board (IRB) approval. If subjects’ personal details are provided, measures should be taken to protect subjects’ identity. If photographs are submitted with a manuscript, permission to publish must be obtained in writing from all individuals pictured. Measures to conceal the identity of an individual in a photograph, such as placing black bars over the person’s eyes, should not be used. A position paper is a comprehensive analysis of a significant topic in occupational therapy that may have political or sociological factors that impact clinical practice. It includes references and primary sources. Manuscripts should be prepared following the Publication Manual of the American Psychological Association, sixth edition (2010), and spelling should reflect Dorland’s Illustrated Medical Dictionary.Manuscripts must be double-spaced, with 1-inch margins. IMPORTANT! Manuscript files uploaded for review should NOT include any of the authors' names or institutional affiliations to facilitate blind peer review. Files MUST include continuous page and line numbers. Manuscript titles should be concise, specific, and informative and should contain the key points of the work. Overly general titles, as well as questions and declarative sentences, should be avoided. The abstract should be 150-200 words and include the limitations of the study and recommendations for further research. Manuscripts should include 3-4 keywords that relate to the main topics covered. Original Research and Review manuscripts should be approximately 5,000 words, including abstract and references. Case Studies/Reports should be approximately 2,500 words, including abstract and references. Word count guidance does not include title page, tables, figures, images, illustrations, or legends. Use of abbreviations should be limited to those that are commonly understood without explanation. All abbreviations must be spelled out at first mention in the text. Pharmaceuticals should be referred to by their generic names. Device manufacturers and their locations should appear in parentheses following the mention of devices. References should emphasize the most recent and relevant works, and must adhere to the style specified in the Publication Manual of the American Psychological Association, sixth edition (2010). Authors are responsible for the accuracy of references, particularly author names and page numbers. Names of journals should conform to PubMed/MEDLINE. The titles of those journals that are not listed in PubMed/MEDLINE must be provided in full. Journal titles should be cited as they existed at the time of publication. Each figure must be numbered and cited consecutively in the text. If applicable, arrows or asterisks can be present on figures for identification of specified areas that are discussed in the legend. Permission. Drawings or computer-generated images submitted with a manuscript require permission to publish from the artist. Authors must disclose whether any figures or tables have been previously published; such materials must be accompanied by a letter of permission from the publisher, which extends non-exclusive worldwide rights to reprint the material for all forms of media now or hereafter developed to SLACK Incorporated. Content from U.S. government websites (eg, NIH, CDC, USDHHS) is in the public domain and generally can be used without permission. However, some content on these sites may be from another source, in which case permission must be obtained from the copyright holder. Legends. The legend should be a brief description that allows the figure to be fully understood. Legends, headings, or captions should not be included within the image files, and instead should be provided in the manuscript files. Each table must be numbered and cited consecutively in the text and should have a short, descriptive title. Abbreviations used in tables that are not commonly understood should be explained in a table legend. Material that is in the tables should not be repeated in the text. Manuscripts are evaluated based on their scientific rigor, novelty, and importance to the area of occupational therapy, using the following criteria: topic is of interest, material is original and timely, writing and organization are clear, design and methods are appropriate, data are valid, and conclusions are supported by the data. Supplemental material or data submitted with a manuscript will undergo peer review with the main manuscript. If the manuscript is accepted for publication and if the supplemental material is deemed appropriate for publication, the material or data will be posted online only with the article at the time of publication. Supplemental material will not be copyedited or formatted; therefore, the authors are responsible for the accuracy and presentation of the material. The publisher and editor will take reasonable steps to identify and prevent the publication of papers where research misconduct has occurred, including but not limited to plagiarism, citation manipulation, and data falsification/fabrication. Before any manuscript is accepted for publication in the Annals of International Occupational Therapy, it will be screened for potential plagiarism with specialized software, and the Journal will contact the authors if there are any questions or concerns. If an allegation of research misconduct is made related to an article published in the Journal, the publisher and editor will follow the guidelines provided by the Committee on Publication Ethics (COPE) to address such allegations. The Journal offers an open access publication option to authors of accepted peer-reviewed articles. With this option, articles are made freely available online immediately upon publication in exchange for payment of an article-processing charge of $1500. 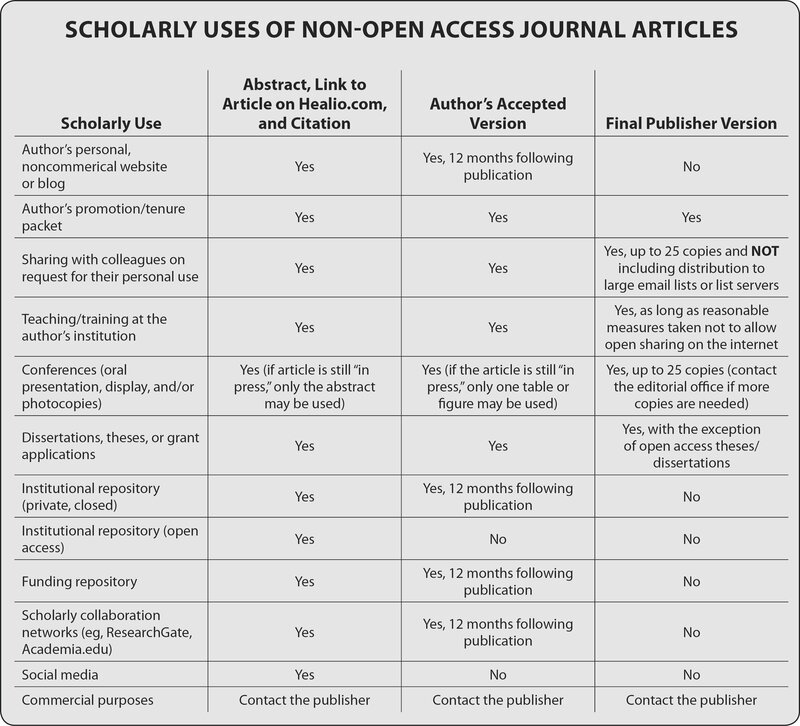 SLACK Incorporated’s Open Access Publication Policy can be found here. All accepted manuscripts are professionally copyedited to adhere to the Publication Manual of the American Psychological Association, sixth edition (2010), and journal style. The Journal reserves the right to delete extraneous or excess material, and change or add titles and headings. Proofs of the edited article are provided to the corresponding author for review and approval. Rewriting the manuscript or making frivolous changes at the proof stage is unacceptable. Authors are responsible for all statements made in their work, including changes made during copyediting and production that are approved by the corresponding author. Letters to the Editor are correspondence regarding articles previously published in the Annals of International Occupational Therapy or other topics relevant to the field of occupational therapy. If the letter is regarding a previously published article, it must be submitted within 12 months of the article’s publication to be considered for possible publication, and the author of that article will be given the opportunity to respond. Letters should be no longer than 500 words, with no more than 5 references. Letters may be edited for clarity or length, and letter authors must disclose any competing or conflicting interests, if applicable. All letters are published at the Editor’s discretion. Letters should be submitted via Editorial Manager. The publisher works with Portico to ensure electronic backup and preservation of access to Annals of International Occupational Therapy content.